Every Prepper knows the importance of water. Quite simply, you can't live without it. Within three days, dehydration will take hold and death soon thereafter. The procurement and catchment from a water source is step one, Water Purification is step two. The water you're hoping to drink might be riddled with parasites or bacteria particles, you can't afford to skimp on water purification. In the very circumstances that put you in contact with questionable water (being in the wilderness, surviving or recovering from a disaster, or living in a part of the world where water isn't purified for you) the last thing you want to do is to get sick with dysentery, etc. 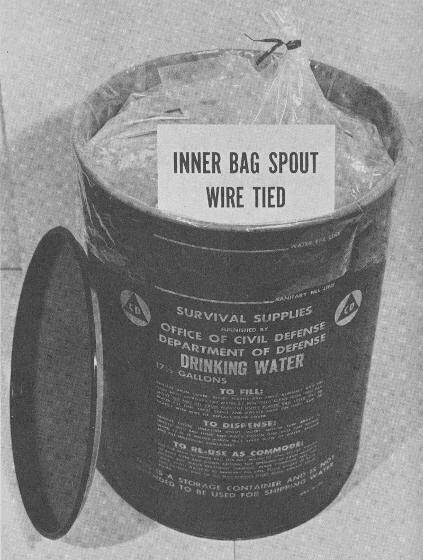 This is one of the most common water purification methods in a survival situation. Place the water you wish to purify into a pot. Try to strain the water through a cloth or an unused coffee filter. Place the pot on the stove and turn the stove on to high. When water boils, any bacteria that may have been living in it will be killed, thus ensuring that you do not get sick when you drink the water. Watch for rolling bubbles. When bubbles begin to appear, it means that the water is boiling. Let the bubbles continue for a solid five minutes for the heat to have the most effect upon any bacteria that may have been living in the water. Boiling water for 15 to 20 minutes will kill off 99.9% of any organisms living in the water. It also removes most chemicals by vaporizing them. 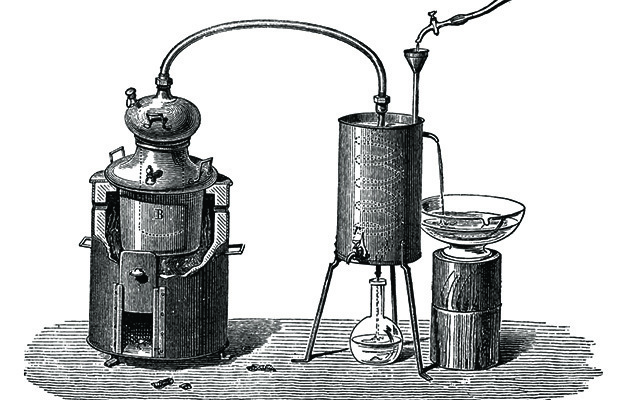 However, be aware that boiling the water will not remove solids, metals, or minerals. Remove from heat, carefully. Let the water sit and settle. You do not need to do this if you are boiling water that came from a tap and you feel sure that there are no solid items, minerals, or metals in the water. If you let the water settle, any items in the water will sink to the bottom naturally, allowing you to drink the pure water from the top. Using purification tablets or drops is the easiest water purification methods. You can purchase these drops or tablets at sporting goods and adventure stores. Keep in mind that this is not the best tasting method, but protection from bacteria is worth a bitter taste in your mouth. Iodine tablets are the most commonly sold purifying tablets, but you can also use chlorine tablets with the same result. These tablets are most effective when the water you are purifying is 68 degrees F (21 degrees C) or higher. These chemical tablets will kill bacteria living in your water. These tablets are most often used by campers in the wilderness. Pregnant women, women over 50, and people with thyroid problems or taking Lithium should consult with a doctor before using iodine tablets. Strain the water if it has large particles floating around in it. You can do this by pouring the water through a cloth and into the bottle or container that you will be purifying your water in. The cloth acts as a strainer that removes the particles floating in the water. Place the tablets in the water. If your tablets or drops came with instructions, follow these now. In general, you will want to use one tablet for each quart or liter of water you wish to purify. Be aware that these tablets generally have an expiration date. If you use them after this date, they are much less likely to be effective. Always check the bottle before using these tablets. Mix the tablets into the water until they dissolve. They must be completely dissolved so that they can mix most effectively with the water you are purifying. Wait 30 minutes before drinking the water, as the tablets need that time to effectively kill any bacteria in the water. You should also be aware that tablets are generally less effective in water that is very cold. If the water is 40 degrees F (4 degrees C), you should wait at least an hour after the tablets have dissolved before drinking the water. You can place the water in the sun to warm it up before using the tablets if you have the time to do so. To lessen the strange taste the tablets give the water, add flavoring to the water (if it is available to you.) Powdered lemonade mixes or a pinch of salt will mask the tablet flavor. Use a pump purifier. 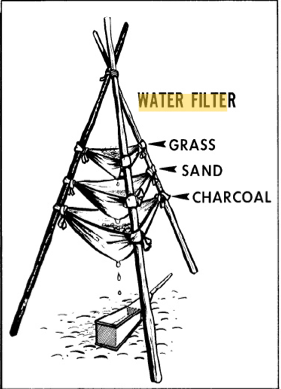 You can use these types of purifiers in conjunction with a canteen or water bottle when out in the wilderness. These pumps are generally hand held and made out of a synthetic or ceramic cartridge. Most filters have two separate hoses, one for clean water, the other for dirty water. On the hose that pumps the dirty creek or lake water, you may find a foam flotation device that keeps the hose from sinking to the bottom and sucking up the silty bottom water. The pump will have a plunger or lever that can be pulled and pushed so that water is sucked up, run through a series of filters within the plunge, and then pumped out and into your water bottle. Buy a water bottle with a built in purifier. You can now buy water bottles that have their own filters already built in. These work much like the pumps in that they run the water through a filter before dispensing the water into the bottle. Try out a gravity fed purifier. These are filters like the ones used by Brita and PUR. As the name suggests, these filters use gravity to pull the dirty water through a filter and into the reservoir that contains clean water. To use this purifier, all you have to do is pour unpurified water into the dirty water section, and wait until all of the water has run through the filter. Often, these filters will have two sections--one for dirty water, and the other for clean. These filters are best used at home or at a campsite as they are generally pretty large and would be a pain to tote around in the wilderness. If using Chlorine/Clorox, get and use a non scented and non soapy version. Use five drops per gallon (or two drops per liter/quart*). Mix and let set for at least five minutes. The five drops per gallon ratio is the best and proper mixing ratio. However, two drops in a liter or quart sized bottle is overkill but much safer than adding just one drop. When able, work with gallon or larger volumes of water (try to avoid working with just quart or liter volume sizes of water such as canteens or refilled soda bottles) - Best to refill from a treated gallon, or larger container. The use of Calcium Hypochlorite, or Pool Shock, as alternative to liquid bleach will be discussed in more detail in another post. There are two additional methods which require survival and bushcraft skills. They will be dealt with in more detail in other posts.